FULHAM | Lonergan, Richards (Fredericks 72), Garbutt, Hutchinson, Cairney, Kacaniklic (Hyndman 72), Christensen (Smith 84), O'Hara, Dembele, Burn, McCormack (c). SUBS | Lewis, Stearman, Fredericks, Smith, Ream, Williams, Hyndman. WOLVES | Ikeme; Iorfa, Batth (c), Ebanks-Landell, Doherty; McDonald, Coady, van La Parra (Le Fondre 89), Edwards, Graham (Byrne 86); Zyro (Henry 83). SUBS | Martinez, Golbourne, Saville, Price, Henry, Byrne, Le Fondre. 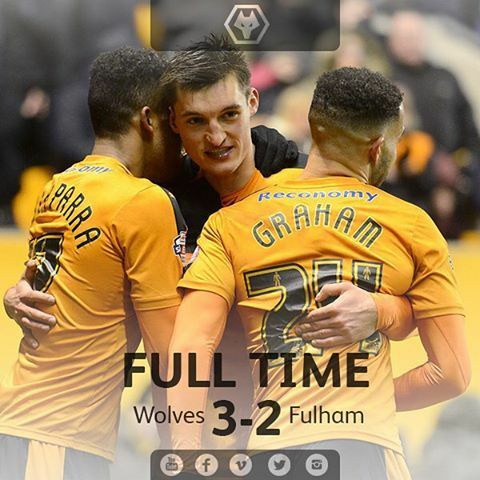 Full time here at Molineux and it's finished Wolves 3, Fulham 2 - a very entertaining contest. Wolves made a brilliant start by going 2-0 up in the first 13 minutes. Polish international Michal Zyro had a home debut two remember scoring both goals, the first from a Graham cross, the second from a ball over the Fulham defence by Edwards. Fulham pulled a goal back in the 24th minute when Lasse Vigen Christensen met Jazz Richards' right wing cross to head past Ikeme. Wolves continued to attack however, and on another day Zyro could have had two more goals, but at the interval it was Wolves who lead 2-1. In the second half Matt Doherty increased Wolves lead with a great strike from 35 yards out after Fulham had cleared Graham's free kick. Rajiv van La Parra missed a great chance to score Wolves' fourth goal when he shot over after Danny Batth's header was well saved by Lonergan. Fulham came back into the game when McCormack struck a powerful shot past Ikeme in the 74th minute. 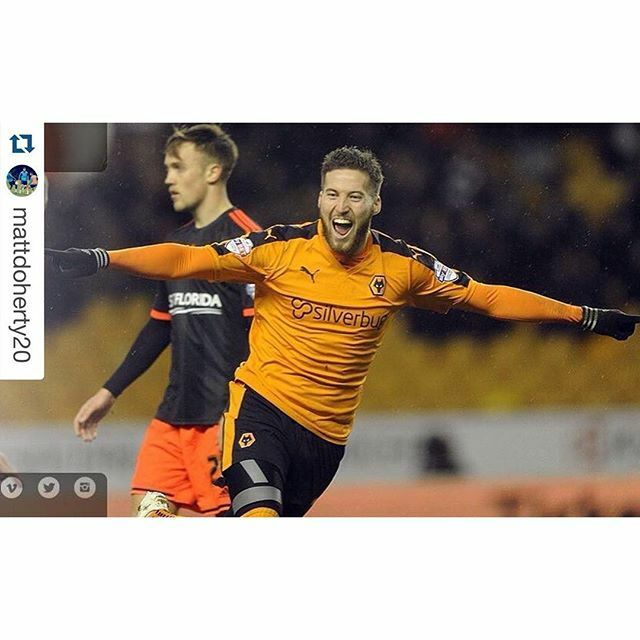 But it was Wolves held on for a much needed three points. From myself and Otto, thanks for joining us here tonight and we look forward to seeing you all again for Saturday's home match with Cardiff City, 3pm kick off. Thanks guys.. have a good week all. Thanks everyone for your company. I'm happy - not Jimbo in an hour happy - but happy! Very entertaining game of football this evening...2 goals from Zyro on his home debut and a cracker from Doherty! Good result ... could have been a few more Wolves' goals.